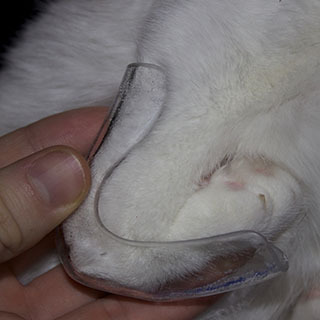 Custom prosthetics for a cat - the thought can seem daunting. However, for Derrick Campana, owner of Animal Orthocare, the bigger the challenge the better - figuratively and literally. 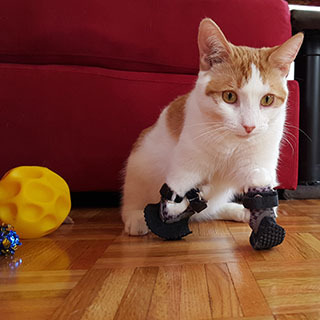 Whether it's a kitten, dog, horse, camel, cow, or even an elephant, Derrick can design and produce orthotics and prosthetics for whatever the need may be. The picture to the left shows Derrick's largest patient. He used steps similar to what we used for Watson to create the elephant's prosthetic leg. The idea of prosthetics excited me, but I knew it would be a long process. 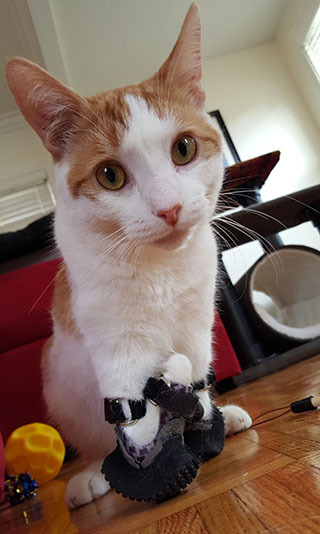 After contacting Animal Orthocare, Derrick sent me a kit to make a casting of Watson front legs. Normally, this can be done on a relatively calm, normal animal without too much hassle. Watson, however, is a cat, and as many of you know, cats do not like being told what to do and getting them dirty… well that’s just an extra offense right there. In addition, Watson’s arms were so little and the joints on each leg do not move at all so you cannot straighten his front legs, making for a really tight work space. For these reasons, I enlisted the help of my vet to make Watson’s casts. 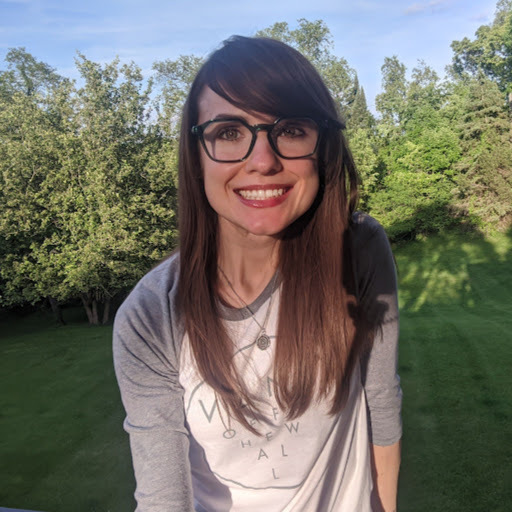 A big thank you to The Cat Practice, Dr. Larson, and the rest of her team of veterinary nurses. They have worked with me every step of the way keeping an open mind to different solutions to improve Watson’s life. With their help, we were able to sedate Watson in order to get the most accurate casts possible without stressing him. The casting process begins by putting a condom (yes, that’s what they typically use) over the leg and placing a cutting strip, a pliable piece of plastic, down the length of the leg, which makes it possible to easily guide scissors down the cast after it dries. Since Watson was so little, we used the finger of a glove instead of the condom. The casting material looks similar to a roll of gauze. The whole roll gets soaked for a few seconds, and then you carefully wrap it around the leg while the animal is in his or her natural standing position. Working quickly is key as the material hardens quickly. After wrapping a thin layer around the entire leg, you make sure it is smooth and contoured to match the animal’s leg. After the cast dries, a line is drawn down the cast as a guide to follow the cutting strip more easily. After making the cut, the cast pulls off and resembles the form of your animal’s leg. The casts are then sent to Animal Orthocare where they can analyze them using a 3d scan to create a mold of what will fit around the animal’s leg. Animal Orthocare then sends a prototype mold back to the client to see if the fit is right. As you can see from the pictures, Watson’s had to be adjusted at the joint to match his legs perfectly. My husband and I were able to do this part ourselves by taking a heat gun and slightly applying heat close to the plastic mold. This softened the mold enough that we were able to squeeze the two ends together to make the angle of the joint smaller until it fit Watson just right. If you would ever be doing this, I recommend consulting with Derrick first and making sure all safety precautions are followed. Obviously you do not want the heat gun anywhere near an animal. It is just a matter of patience - adjusting a little bit, letting it cool, seeing if it fits, and then doing it again and again to get the right fit. After lots of pictures are taken, the molds are sent back to Animal Orthocare. Then comes the fun part of picking colors or patterns for this part of the prosthetic. Once Animal Orthocare is finished with the base of the prosthetic, Derrick sends it to the client for the animal to try on and wear for a while to get used to having something on his or her leg(s). At this point, no height has been added; it is simply to get the animal acquainted with wearing something. This is a very gradual process. You typically go in half hour increments, adding a half hour of wear time each day. This helps prevent any soars or swelling on the animal’s limb. After the animal gets acquainted and used to wearing the prosthetic, it gets sent back for round two. This is when height gets added. This is also a gradual process so that the animal can get used to the new height addition, and the owner can take pictures and measurements to see if it is the right height or if more needs added or taken off. Adding the height improves the animal's gait, therefore keeping their spine and hips aligned, which helps prevent future pain. 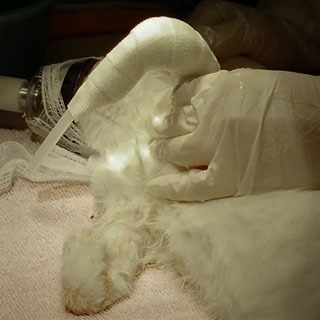 Animal Orthocare makes an assortment of items to help keep animals on their feet. 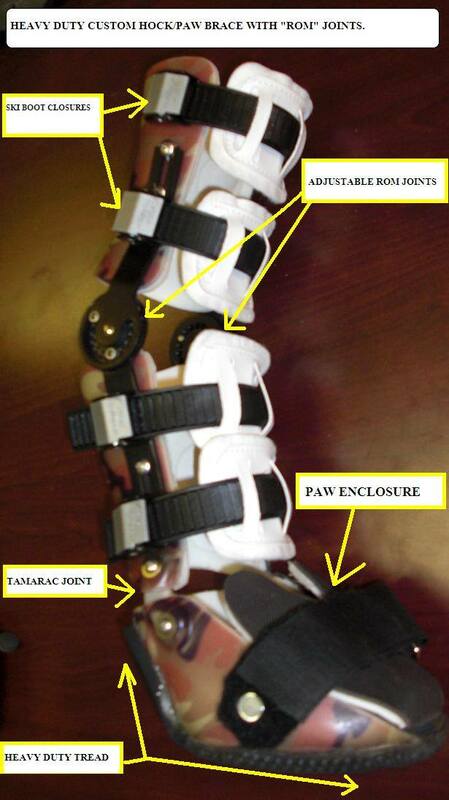 From prosthetics to all sorts of orthotics (see the picture below for an example of a hock/paw brace). Derrick is always ready for a challenge and will attempt to come up with a solution for whatever issue your animal is experiencing. Derrick uses all the latest technology to create prosthetics and orthotics that are lighter, more durable, and comfortable for your furry friend. 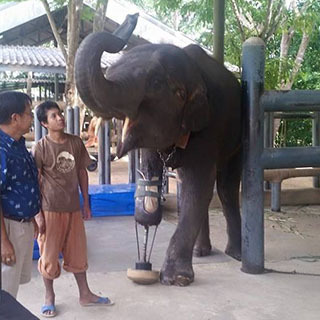 He has proved that with a little ingenuity and a lot of work, an animal with a deformity, injury, or disability can have a chance at a happy, relatively normal life. 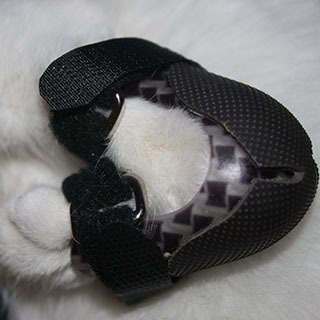 Example of one of Animal Orthocare's Hock/Paw Braces. Derrick Campana works out of Animal Orthocare’s main office in Chantilly, VA. I am nowhere close to Virginia, however, we were able to do everything without ever actually meeting in person. For more information on what Animal Orthocare does, visit their Facebook page or website. To provide support for families with animals that cannot afford orthotics or prosthetics, visit www.injuredpets.org. Oh, Watson, poor baby... You have such gorgeous caring mum and dad!